A commonly repeated definition of a “weed” is “an unwanted plant.” This broad definition can make the process of identifying – and controlling – weeds a bit daunting. But understanding a few common weeds, and particularly learning about those that may pose health or wellness dangers, is an important first step toward maintaining safe, healthy lawns and other outdoor spaces. Problem: The tissues of these plants contain poisonous oil that causes allergic reactions to more than half of the U.S. population. Appearance: Poison Ivy and poison oak normally have three leaflets, which are groups of leaves all on the same small stem. As a result, many people use the saying “Leaves of three, let it be” when trying to identify these plants. Poison sumac has seven to 13 leaves on a branch. Control: Poison ivy, poison oak and poison sumac can be controlled with herbicides. You may have to treat the weeds with herbicides several times, as these plants are very persistent. DO NOT try to get rid of these with a lawn mower or weed wacker as both of those tools will simply spread the weed and will likely end up on your skin in the process. Problem: This weed produces a large amount of pollen that causes seasonal allergies for many Americans. Appearance: The leaves of ragweed look fern-like, green, and hairy. The flowers are yellow, long, and normally found in clusters at the top of the plant. 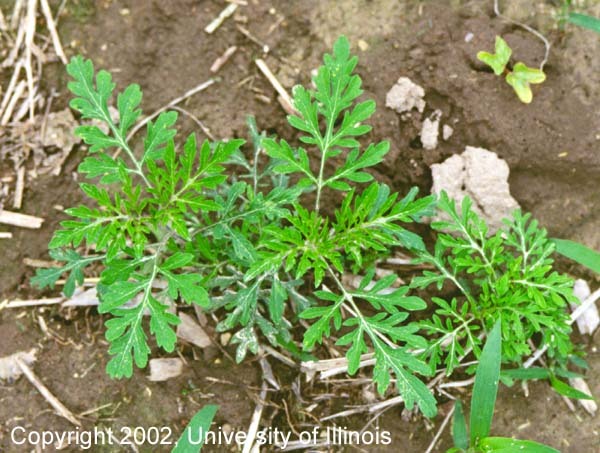 Control: Ragweed can be treated with broadleaf herbicides. Mowing and cultivating open flower beds can also help control ragweed. Problem: This common weed disrupts the growth and appearance of lawns. Appearance: Crabgrass looks more like a plant than grass. Its leaves can resemble the legs of a crab, hence the name crabgrass. The flowers have small node-like heads and grow at ends of stems or in clusters along the length of the stem. If left unmowed, this weed can grow as tall as six inches. Control: Crabgrass can be controlled with herbicides. Mowing your lawn at optimum heights can also reduce its germination and establishment. For more help identifying your unknown weed, visit Better Homes and Gardens to view their Weed Identification Guide.